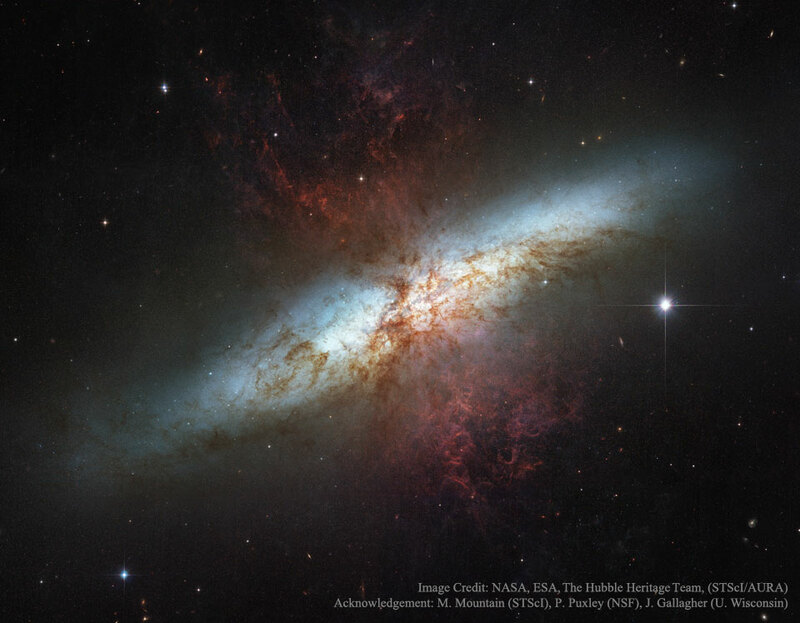 Explanation: What's lighting up the Cigar Galaxy? M82, as this irregular galaxy is also known, was stirred up by a recent pass near large spiral galaxy M81. This doesn't fully explain the source of the red-glowing outwardly expanding gas, however. Evidence indicates that this gas is being driven out by the combined emerging particle winds of many stars, together creating a galactic superwind. The featured photographic mosaic highlights a specific colour of red light strongly emitted by ionized hydrogen gas, showing detailed filaments of this gas. The filaments extend for over 10,000 light years. The 12-million light-year distant Cigar Galaxy is the brightest galaxy in the sky in infrared light, and can be seen in visible light with a small telescope towards the constellation of the Great Bear (Ursa Major).